Gorgeous Tuscan (aka dinosaur) kale. Don't let Husband hurt your feelings, litlte kale, I still love you. Boy was I proud of myself on Valentine’s Day! For a while, anyway. I planned a red main dish: Indian butter chicken, which has a tomato-based sauce, accompanied by cardamom rice (1 cup long grain rice, steamed with 2 cups water, a tablespoon of ground cardamom and 1/3 cup golden raisins). The dal-kale stuff didn’t look like much but tasted okay in a healthy way. I served it. Husband, who rarely dislikes anything, reacted with an exclamation and a grimace. “Whoa! 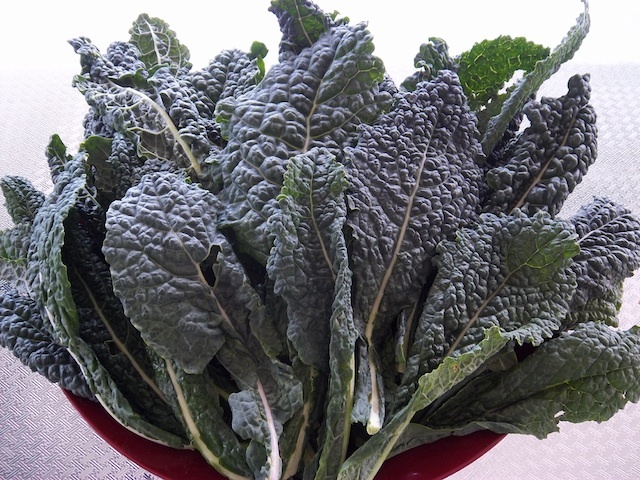 This kale is an acquired taste,” he blurted. Well, I’m sure I’ve served him kale before without any ill effect. I’m convinced he bit into a cardamom pod on the first chomp and got a hit of something that shocked his palate. He swears it’s the kale. So guess what he’s getting as a vegetable tonight? Kale, sauteed in olive oil with lots of garlic. Ssssshhhhhh. Let’s see if it’s really the vegetable that’s the culprit. Anyway, that dal-and-kale thing? Down the garbage disposal. A group of Oahu Master Gardeners had a kale party in Kapahulu last Sunday around lunchtime, and a great time was had by all. We exchanged kale recipes, took home kale starter plants, and cooked with kale of course. I am going to make the Kale and Sweet Potato Dal in Wednesday’s newspaper very soon. I hope that that recipe wasn’t the one you tossed in the garbage disposal. I love kale raw too. bubbly ???? :SIMPLY DEFLAKE THE GARLIC FRESH POD AND SWALLOW WHOLE, WITH WATER IN THE MORNING.EASY AS THAT.Those individuals, who want to eat gailrc because of its medicinal properties but do not want to suffer the consequences of having bad breath, should chop up or mash up the gailrc.They should then place the chopped or mashed gailrc on a spoon and swallow it with the glass of water.This method ensures that the gailrc does not stay in the mouth longer than necessary. This will reduce your chances of having bad breath.